The Hill reports Wednesday: “Congress is poised to face off with President Trump for a second time over his administration’s policy toward Saudi Arabia, as lawmaker groups in both chambers reintroduce resolutions to end U.S. involvement in the Yemen civil war. 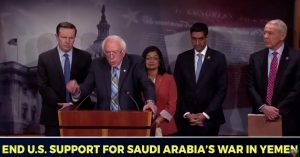 “The Senate voted 56-41 in December to pass a resolution from Sanders, Murphy and Lee that would withdraw U.S. forces in or ‘affecting’ Yemen, except troops fighting al Qaeda and associated forces. “It was the first time a chamber of Congress voted in favor of a war powers resolution since the War Powers Act was passed in 1973. “But the Republican-controlled House last year blocked Yemen war powers resolutions from coming to the floor for a vote. With Democrats now in the majority, Khanna’s office said it expects the resolution to come to the House floor next month.